For nearly half a century nurse Mary Cox has been caring for patients – and there is no sign of the 68-year-old stopping soon. The dedicated paediatric surgery staff nurse qualified in 1971 and has been working at City Hospital, Birmingham ever since. In Mary’s daily role, she ensures that everything is ready for patients when they come to hospital for their operation. She said: “I love my job so much. I get to meet so many people from all walks of life and be there for them in their time of need – I love looking after children, and some of them can be in pain, or sometimes distressed. “My team and I always try our best to distract them with games and stories. 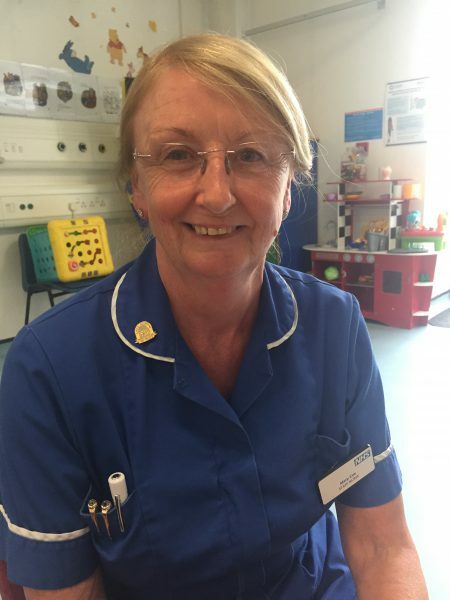 Mary, who lives with her husband Bob in Derbyshire, said she feels privileged for having the opportunity to work for the NHS, one of the most beloved institutions in the country, for so many years. She smiled: “The NHS has truly transformed the way it cares for people. The quality of treatment is getting better every day. “Years ago babies diagnosed with cystic fibrosis, a genetic condition affecting the lungs, had a very low chance of survival past their first birthday. The keen gardener has plenty of memories of the NHS over the years, particularly from the 1970s. “Many of our disabled patients were in hospital for long periods of time because they weren’t able to be treated at home, so we had a school for them based within the hospital. Mary credits Bob as her inspiration – as well as one of her colleagues. She said: “My hero is my husband. Not only is he a clever man but also he has a positive outlook in life. He can always find a solution for any challenge and that really inspires me. Outside work, Mary enjoys looking after her garden and cooking for friends and family.